We will be starting Nathanael on the Ketogenic Diet sometime by end September. We are awaiting for the confirmation dates from both the Dietian and Metabolic Doctor on the dates and Nathanael will have to hospitalized for this procedure to take place. Unlike what we normally know as a “diet”, this is not just an abstinence of food, but a mathematically calculated diet done at all times to ensure that the correct amount and correct type of food is given to Nathanael. Can u imagine, we can only be one gram off the scale of what we are to feed him. So you can imagine how intense it can be. In future, once we commence the Ketogenic Diet, we cannot just feed him off the table with whatever that we are consuming, we have to be extremely careful. For those of you who want to know more about the Ketogenic Diet, Click Here. But in Brief .. read the paragraph below to get a clue! The Ketogenic diet is a special diet to help children treat epilepsy seizures/fits.The name ketogenic means that it produces ketones in the body (keto = ketone, genic = producing). Ketones are formed when the body uses fat for its source of energy. Usually the body usually uses carbohydrates (such as sugar, bread, pasta) for its fuel, but because the ketogenic diet is very low in carbohydrates, fats become the primary fuel instead. Ketones are not dangerous. They can be detected in the urine, blood, and breath. Ketones are one of the more likely mechanisms of action of the diet; with higher ketone levels often leading to improved seizure control. So we ask that you pray along with us on our next step of the journey to help Nathanael cure his seizures. We will update you further on the confirmation of the dates and more details in the Blog. So keep coming back. The picture above : Tks Daniel, took it from your Flickr website. It was such a great picture taken during our recent Healing Rally in church. Thanks!! We at The Patient Connection are currently running a research blog or online discussion on the subject of current treatment options for epilepsy. We are seeking the opinions of both people with epilepsy and parents/carers of children with epilepsy. In particular we are interested in your experiences of medication, a ketogenic diets or indeed surgery. The blog is anonymous and easy to use so I’d like to thank you for your contribution in advance. Thank you for keeping us updated on Nathanael’s well being. He’s looking great and hope he will be stronger and stronger each day. Nathanael is very fortunate to have you and Tiffany as loving parents. U know what? God must have placed somethin’ in U! 🙂 Thank God for the blessing, keep praying ya! 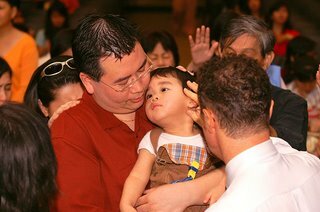 Praying along with you for Nathanael’s well-being and healing. Keep looking up–Our God reigns! Congratulations to Nathanael and his parents. Well done! It is so good to see him holding his own bottle and sitting up….brings tears to my eyes. Please let Tiffany know that she is the best Mum ever! I did not know that you were expecting another child. Again, well done….I pray that all goes well. As for Nathanael, he is always in our thoughts and with parents like both of you, I do see the light at the end of the tunnel. But we will keep on praying for him to get better each time. His ketone diet sounds like the one I am on…no carbo, only meat and vegetable and no fruits/desserts and very select fruits (low sugar as they convert to carbo). Anyway, fingers and toes crossed that all goes well with this diet. Keep us updated when you have time. U know what!?!?!? A thought of you guys getting pregnant rushed through my mind sometime yesterday/few days ago. Checked your blog today and voila!